Сейнт Джон Хил – St. John Hill Bansko Ski & Spa Resort » Where Bulgaria loves to ski! St. John Hill is a luxury apartment-hotel in Bansko, Bulgaria and is located at the highest point in town. The St. John Hill Ski & Spa resort (Сейнт Джон Хил) is located in the best area in Bansko as it is located in the picturesque St. Ivan Rilski district. The St. John Hill Hotel complex has stylish and comfortable furnished studios, one bedroom, two bedroom and three bedroom apartments. Although most guests tend to visit us during the winter season, Bansko is a genuine all year round destination regardless of the weather. Want to know more about our rooms? WHAT TO DO WHILE IN BANSKO? Over 70+ km of pure fun! Relax and unwind in our thermal pool. The elevated position provides fantastic panoramic views of Bansko, the Pirin, Rila and Rodopi mountains. St. John Hill’s location in the foothills of the Pirin mountain provides easy access to the centre of Bansko and the gondola ski-lift. Bansko, once mainly a farming and merchant community, has become an international center for winter and summer tourism. Nowadays Bansko is a true 4-seasons resort. The mountain peaks near the town, the numerous lakes and the old pine woods make it a popular site for recreation all the year round. Recent improvements have been made to the infrastructure and organization of the ski area on the Tordoka peak to accommodate the rising number of tourists. A gondola lift was built in 2003 removing the need for the minibus ride from Bansko village to the primary base area of Banderishka Poliana. 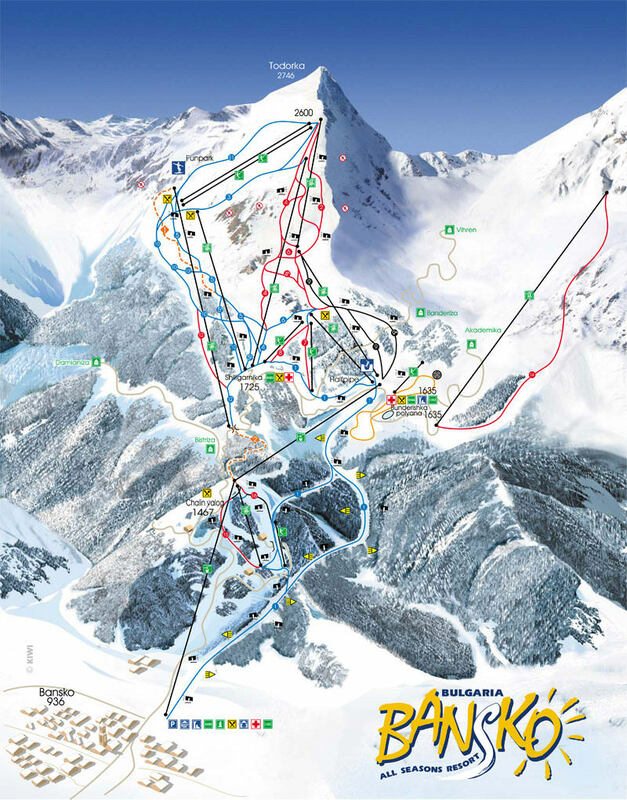 As of 2010, the ski area has 75 km (47 miles) of ski runs, 27 lifts and drags, serving up to 24500 persons per hour. 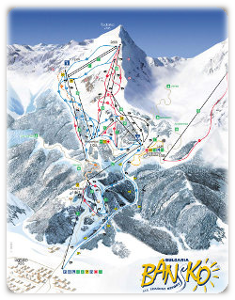 For an overview of available ski-runs, click the map on the right. The large variety of ski-slopes is suitable for all skill levels, from new beginners to accomplished experts. The lift-served Tordoka peak rises to an elevation of 2600m above sea level. The vertical drop is nearly 1,000 m (3,300 ft) to the base area at Banderishka Poliana, and over 1,600 m (5,200 ft) with the ski runs to town. Great value at budget prices is what sets us apart. Luxury, inexpensive and recently redecorated. Great Holiday Destination Winter or Summer. We’ve been visiting Bansko for years! Best family vacation! We loved the clean air and mountain views! The rooms are big enough for a family and the kitchenette help us with the preparation of our baby food. Breakfast room is cozy and modern, service great and food is fine. Beautiful views of the Pirin mountains and excellent skiing, will be re-booking with a group of friends next year! Information for owners in the St. John Hill complex. When you’re away from your property it is very important that you work with a company you can trust. It is essential to have a consistency to allow your guests to have a great vacation whilst staying in your apartment and only deal with one point of contact for all their needs. We further believe a welcoming smile should not be optional! St. John Hill Property Management is ideally situated ensure your property is looked after. The complex itself is governed by the St John Hill condominium and managed by Orenda K but SJH Property Management will help you pay your utility bills on your behalf or be there as a key-holder for added security. You can contact us via the St. John Hill for owners group on Facebook or using the social media links in the footer of this page. We are here to help! We can't wait to welcome you to our hotel. Make sure you also follow us on social media. Designed with ❤️ in Bankso, Bulgaria. © StJohnHill.com All rights reserved.